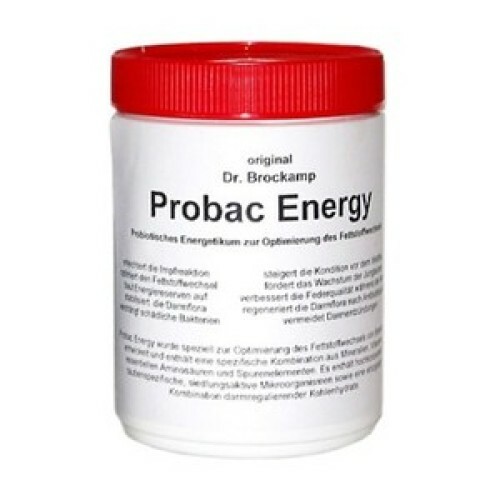 Probac Energy by Dr. Brockamp contains all of the essential nutrients such as amino acids, minerals and trace elements, specially balanced for the lipoid-metabolism of the pigeon. In addition to this it contains not only the same combination of colonizing micro organisms endemic to the pigeon as 'Probac 1000' but also the unique and proven combination of intestinal carbohydrates which aid in the digestive process. This unique composition makes Probac Energy a versatile, all-purpose supplement for use during travel, breeding and moult. Probac Energy is the ideal energizer for carrier pigeons prior to competitive flight. It should therefore always be administered when utmost physical performance is demanded of the pigeons. During the flying season it is recommended that Probac Energy be administered together with 'Probac Lecithin Oil' 1-2 days before participation in competition. In this way the pigeons receive all of the essential nutrients needed for successful competitive flight and reach their top form. The probiotic bacteria contained prevent infections during transport. The recently hatched young pigeon initially has only a very weak immune system. It takes several months until it becomes distinctly developed. Therefore Probac Energy should regularly be administered to breeding pigeons as soon as the crop mucilage has been fed and the fledglings’ diet has been changed over to seed. In this way the young birds get all of the important nutrients and benevolent bacteria needed for their healthy and robust growth. During moult healthy intestinal flora is a prerequisite for optimal digestion and subsequently for impeccable feather development. At just this time pigeons are susceptible to Para Typhus (Salmonellae). Probac Energy is ideally suited to maintaining a balance between intestinal and the immune systems naturally without the use of medicines. The ingredients in Probac Energy are combined to meet the increased demands during moult and insure a superior feather quality. In addition, the immune system is strengthened naturally. It is recommended that feed be moistened with 'Probac Lecithin Oil' 2 –3 times a week and then be bonded with Probac Energy. The missing or inadequately developed immune system in young pigeons is the decisive cause for outbreak of fledgling disease or adenoma. Even before the outbreak of this disease the something must be done to stabilize intestinal flora and to strengthen the natural immune system. Probac Energy has proven itself especially effective as a prophylaxis. The regular use of Probac Energy facilitates growth in fledgling pigeons and leaves no room for intestinal parasites to spread and reproduce. - 1/2 to 2 tablespoons per pound of food.